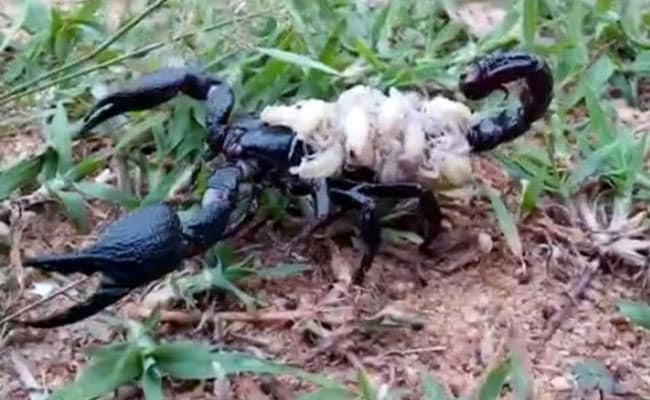 A captivating video has emerged from Odisha's Mayurbhanj where a scorpion can be seen toting her babies on her back. The rare visuals of the deadly venomous black scorpion were captured in Similipal Tiger Reserve by an animal lover. "I captured live visuals of a black, giant and poisonous scorpion giving babies. It is very rare," said animal lover Manas Behera. Interestingly, scorpions are not hatched from eggs like insects. They crawl up to their mother's back and ride there for 10 to 20 days until their outside shell or exoskeleton get hard. A scorpion can also have as many as 100 babies in a single brood. In May this year, a snake from the rare ornate flying snake species was rescued from Mayurbhanj's Dhanpur village in Odisha.